The Poggendorff illusion is an optical illusion that involves the brain's perception of the interaction between diagonal lines and horizontal and vertical edges. Although the Poggendorff illusion and other similar illusions have not been completely explained, they has stimulated much valuable research into human perceptual processes. They have also been utilized by artists to bring about entertaining and impressive effects in their works. The Poggendorff illusion is named for Johann Poggendorff (1796-1877), a German physicist who first described it in 1860. Poggendorff had received a letter from astronomer Johann Karl Friedrich Zöllner, describing an illusion created by a fabric design. While pondering this illusion (which became known as Zöllner's illusion, Poggendorff noted that the diagonal lines in the pattern appeared to be misaligned. Poggendorff described this illusion, which later became known as the Poggendorff illusion. The Poggendorff illusion is an image where thin diagonal lines are positioned at an angle behind wider stripes. 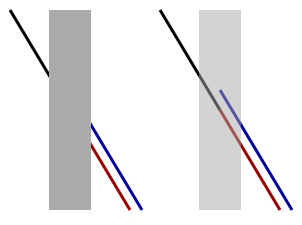 When observing these thin lines, they appear to be misaligned; in the example above, the blue line on the right appears to line up with the black line on the left. In actuality, the black and red lines match up. While the true cause of the Poggendorff illusion is not yet understood, scientists have advanced a number of theories, two of which are the most popular. The angular displacement theory proposes that, in processing, the brain exaggerates all acute angles and minimizes all obtuse angles. When detecting contour orientation, lateral inhibition causes cells in the retina to respond differently to different angles. This would then cause the orientation of the two lines to appear to be on differing trajectories. Critics of this theory point out that when the middle bar is removed, the illusion is still present. With no contour present, the illusion does not appear to depend on lateral inhibition of the contour-orientation cells. A second theory, the depth-processing or consistency theory proposes that the figure is processed as a three dimensional object, not a two dimensional figure. The theory suggests that the brain processes the central rectangle as a three dimensional figure that exists in a plane directly in front of the viewer, while the diagonal lines are perceived as horizontal planes that recede away from the viewer. As in the angular displacement theory, acute angles are overestimated and obtuse angles are underestimated, but for different reasons. Instead of two dimensional distortion, the effect is theoretically caused by a misperception of perspective representation. Unfortunately, the depth processing theory fails to explain certain variants of the Poggendorff illusion, as well as the fact that the illusory effect of the illusion drastically weakens or disappears when the Poggendorff figure is rotated so that the diagonal intersecting lines are oriented vertically. Like other perceptual illusions, the Poggendorff illusion provides a way for scientists to study the way that information is received and processed by the human visual system and brain. ↑ Michael Bach, "Poggendorff Illusion" "Optical Illusions and Visual Phenomena," June 2003. Retrieved December 3, 2007. ↑ "Poggendorff" IllusionWorks. 1997. Retrieved December 3, 2007. Coren, Stanley and J.S. Gigus. 1978. Seeing is Deceiving: The Psychology of Visual Illusion. Lawrence Erlbaum. Schiffman, Harvey. 1995. Sensation and Perception. John Wiley & Sons. This page was last modified on 30 March 2019, at 20:03.